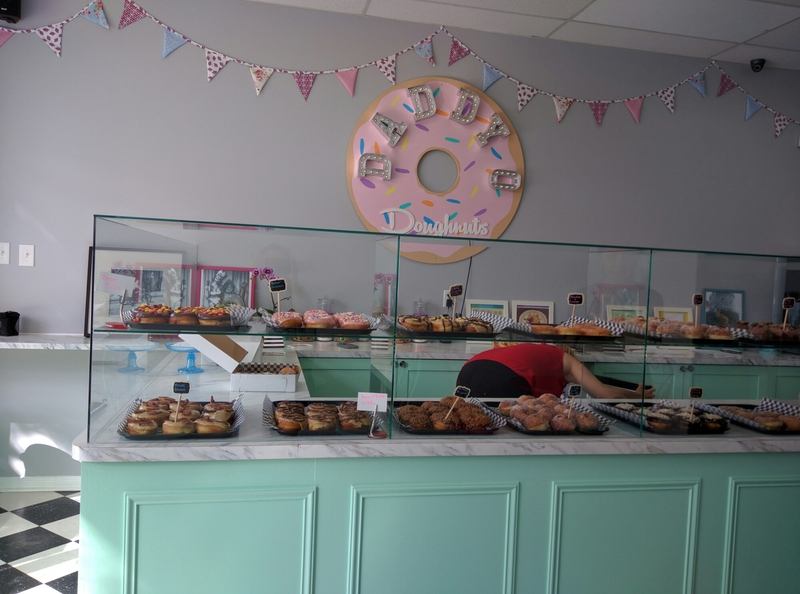 Located in a low traffic area one would never expect to find this new hidden gem – Daddy O Doughnuts & British Baked Goods. YES! Decadent and adorable homemade doughnuts can be found in Mississauga, and more importantly – not too far from me! LOL! 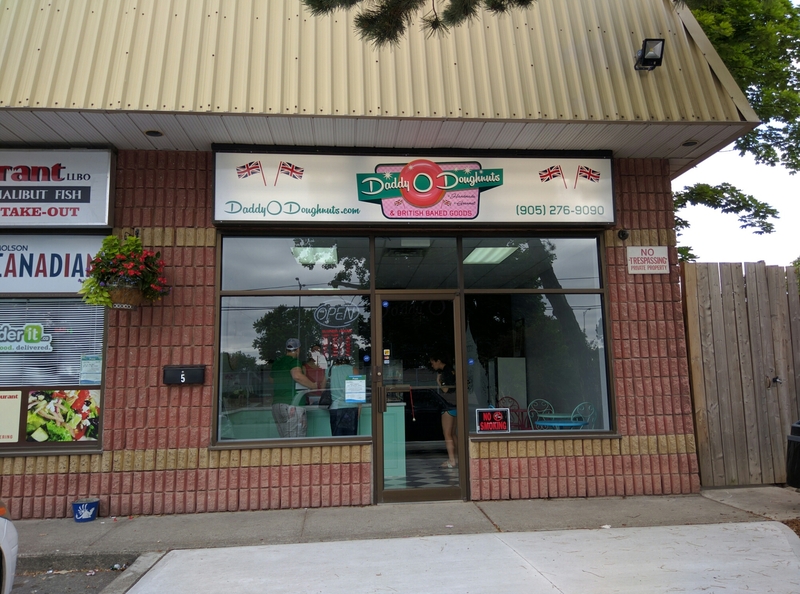 Daddy O Doughnuts & British Baked Goods opened their shop on North Service Road, just a bit east of Hurontario. North Service Road isn’t really a busy area so this doughnut shop would be considered hidden. The little shop has a cute retro decor that reminds you of those 50’s type ice cream parlours. It’s mint and pink colour scheme is fun. The whole vibe is cute and I’m sure little kids would enjoy visiting this cute shop for a heavenly sprinkly doughnut. There was a decent variety of mouthwatering doughnuts on display. (You can enlarge the photo to get a clearer picture of the doughnuts offered). I believe Daddy O’s offers other baked goods such as sausage rolls, or cookies, etc. as mentioned on their website. However we arrived early in the morning and didn’t see any of these other pastries displayed. I did ask the lady if they have Chelsea buns and she responded with eventually. So, I’m just waiting for these Chelsea buns to be available and advertised so I can scoot over and grab a couple. We took a few minutes to decide which six doughnuts to purchase (three for my daughter and three for me). Most of them looked like a sweet coma, most looked droolworthy. The pink Homer Simpson doughnut with the sprinkles looked especially targeted for kids. 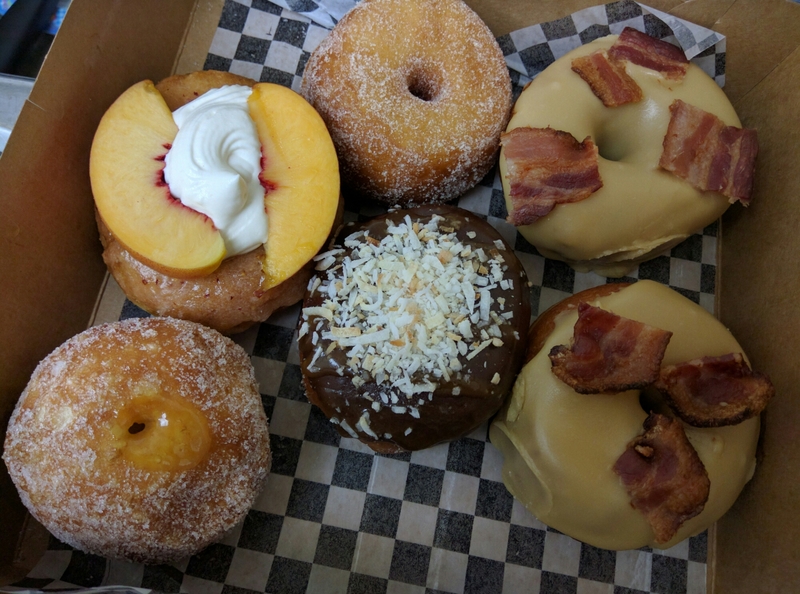 We purchased two maple bacon, one peaches and cream (real cream and peaches were added to the doughnut, so this one needs to be consumed immediately), one cardamom sugar, one Bob Marley lemon, and one German chocolate brownie. The maple bacon had an amazing flavour and the maple glaze is really sugary and sweet. The peaches and cream was original, fresh and sort’ve ‘healthy’ due to the peach. LOL. This was my daughter’s favourite out of the selection she chose. It was easier to eat because it wasn’t as sweet. The chocolate icing on the German chocolate brownie was really rich. The Bob Marley was my favourite of my choices. The dough was nice and chewy. My daughter also liked the cardamom sugar. So basically, we found the doughnuts with the icing on top too sweet, the others with just sugar or that are more plain are easier to eat. I initially believed we would be able to eat all three doughnuts the same day; two is more than plenty to satisfy that sweet tooth and cure any diabetics all at once. We had to save the extra doughnut for the next day. The Daddy O doughnuts were really sweet and the chewy dough is satisfying; it’s the ultimate indulgent pleasure and a real treat if you are able to get your hands on these doughnuts. Daddy O Doughnuts & British Baked Goods was recently compared with Krispy Kreme doughnuts by a local publication, and were questioned on whether they were worried about the big competition… NO, they have nothing to worry about. Homemade and original is always the best! I tried going to Daddy O’s sometime during the week to pick up Chelsea Buns. I got there at 5:30pm and they were closed because they ran out of inventory! Even tho their store sign had a closing time of 6pm. Thank goodness I was on my way home from work, otherwise for others it may have been a waste of time and gas. I went back on Friday after work – yay they were still open and I managed to pick up a couple of Chelsea buns and one Bob Marley donut. This is getting really annoying. I went there at 4:15pm and they were CLOSED. Despite the business hours on their door. It’s really starting to waste my time and gas.